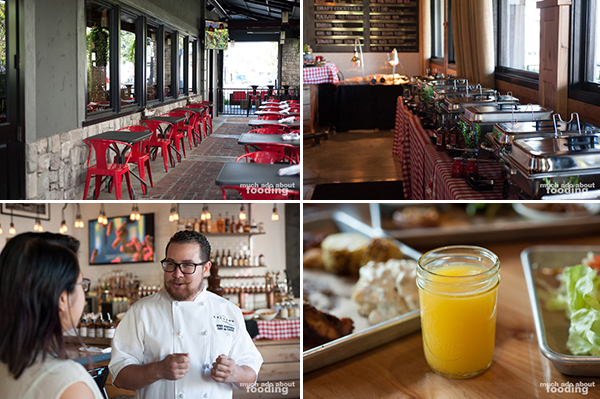 With barely a year under its belt, Lillie's Q in downtown Brea launched a Southern brunch September 20th to take place every Sunday from 10AM-2PM, and they are no stranger to Southern hospitality. 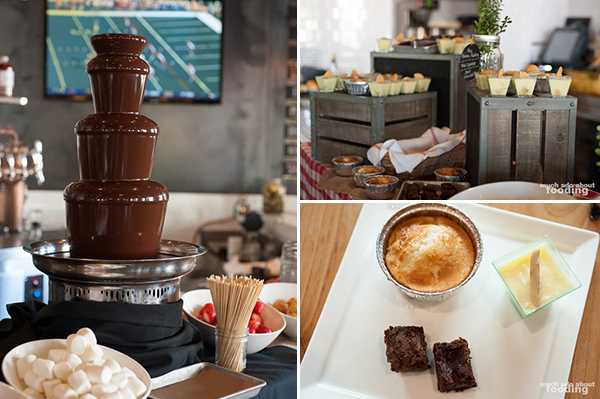 The boastful buffet comes with mimosas, endless amounts of food including their signature smoked meats, and an easy-to-swallow price tag: $24.99 per adult. There is also a short order menu on hand in case you want the chefs to whip you up something wonderful from their brunch list as well as specialty drinks for an extra charge. Started by Chef Charlie McKenna, Lillie's Q has a national reputation along with the chef so it was big news for Orange County when the restaurant opened a southern California location right here in Brea. Now with brunch on its rotation, we're guessing many more people will flock to it because that is an important mealtime around these parts. 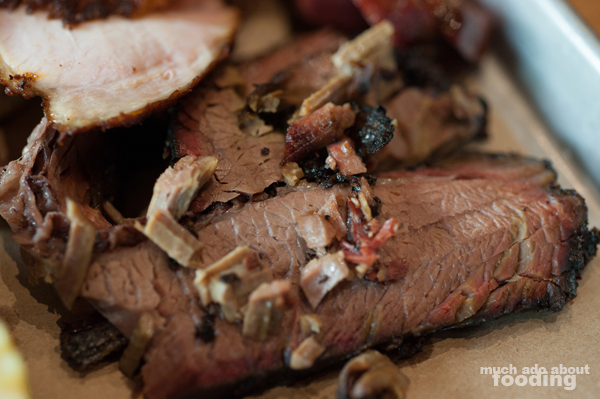 If the smoked meats and Southern dishes don't pull you in, think of the other goodies in store. We stopped in upon invitation one morning to indulge ourselves and take a look at what Chef de Cuisine Kody Havener had in store for brunch that day. Now when I say Southern hospitality, I don't just mean the service (which is excellent); I'm referring to their habit in the South of overfeeding everyone. Aside from the short order menu, all of the items for brunch are available in abundance on chafers to keep warm and make for easy self-service. 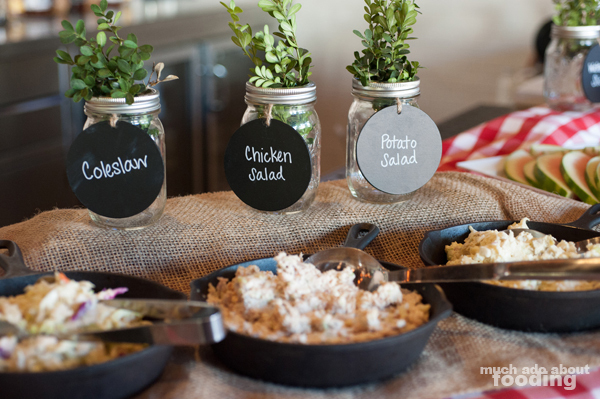 Breakfast items and sides are in the typical Californian brunch realm but with a Southern twist. 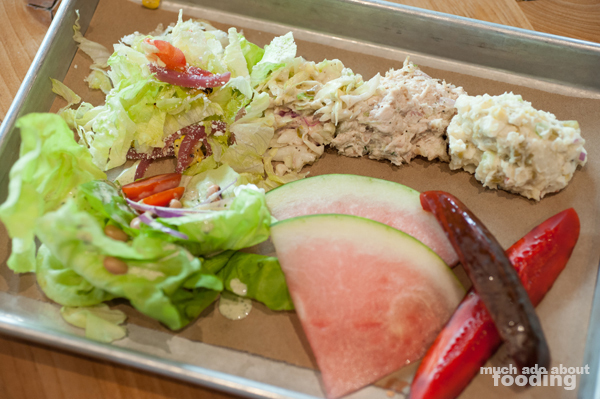 For example, sorghum is used instead of maple syrup and salads take on more of a picnic feel rather than just greens - brunch features potato salad, chicken salad, coleslaw, chopped salad, and the Q salad with a variety of housemade dressings ranging from apple cider vinaigrette to cilantro pepper ranch. The traditional fruit platter is replaced by thin slices of watermelon to add onto the Southern feel, and pickles get a special treatment. 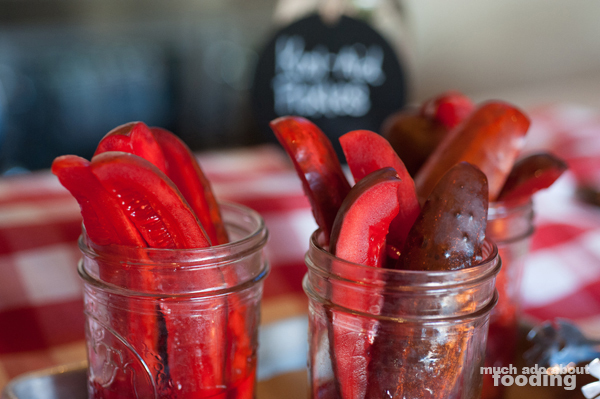 If you've never seen bright red pickles, you're in for a surprise - Lillie's Q marinates their pickle spears in a mixture of Kool-aid and chili flakes, producing an intensely sweet but sharply spicy finish. What's neat about all of the items on the buffet is that they are also part of the menu as parts of whole dishes. You are not getting just "buffet" food that is exclusive to brunch but rather, you can experience bits and pieces of other existing dishes, giving you an easy way to make decisions on future orders. Think of brunch as the test drive for when you finally decide at another meal time that yes, you do want those biscuits with gravy. However, if you are not feeling like a buffet that morning but are out with others who do, don't fret as their regular menu is still available to order from. 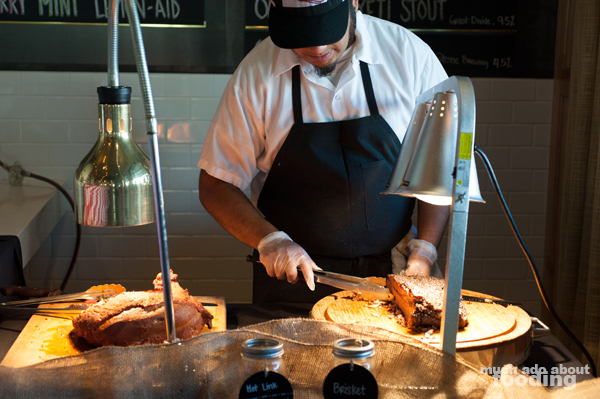 In regards to items on the line, the chafers kept everything adequately warm but the biggest draw for the brunch would have to be the live action station where different meats are cut and served. Chef Kody noted for us that their main three on this station so far are their juicy, moist smoked turkey; hot links; and brisket which are all eventually subject to change. For now, rely on those options while they decide if/when they'll move in tri-tip, chicken breast, and other sausages like chorizo and Italian. 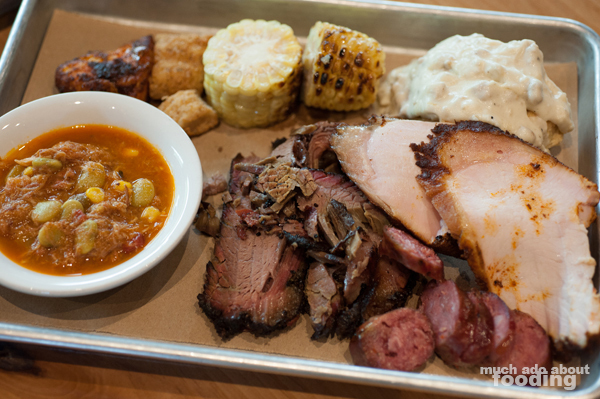 If you're going to tackle the buffet first, expect family-style and using trays rather than plates, a nod to how most BBQ joints serve up their fare. Besides the station and buffet, there is also the aforementioned short order menu. On it, you'll see best sellers that lean more towards common breakfast foods. Omelettes like their Gardeners are a major part of the menu but there are also other gems available such as their Memphis Burrito (pulled pork, salsa, and potatoes). 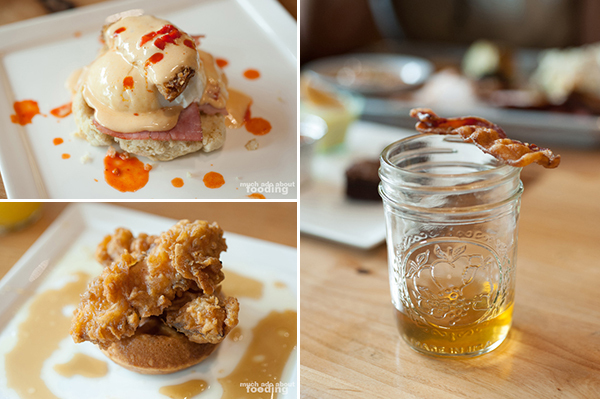 We took at stab at their Southern Eggs Benedict which used a biscuit instead of English muffin, country ham, 63°F egg, fried green tomato, and their "hot mess" sauce. It was indulgent but slightly salty. We then ordered the Smoked Chicken & Waffles (smoked first and then battered) which came on one of the most wonderfully fluffy but thick sweet waffles I've had the pleasure of eating; the batter on the chicken was fabulous as well. These got washed down with a chef-experiment of a cocktail that included baconwashed whiskey and cinnamon syrup. If you're hankering for a swig during brunch, make sure you touch base with what fun things their bartender has in store! So what exactly was the spread for brunch? There was no shortage of food. 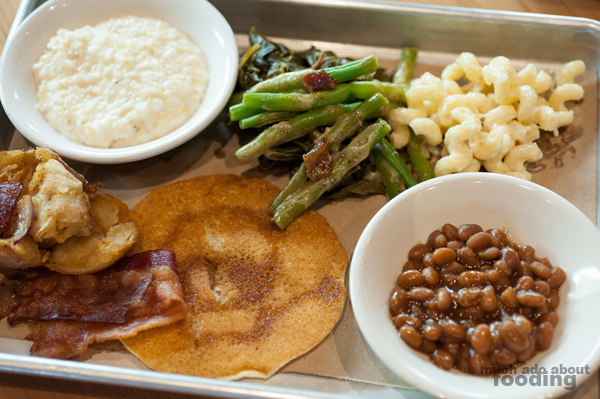 Our first entree platter held grits, collard greens, green beans, mac n cheese, breakfast potatoes, 14-hour smoked baked beans, bacon, and buttermilk pancakes with sorghum. 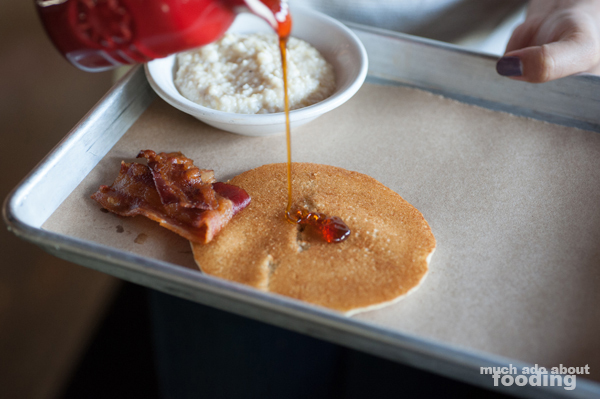 We've always been a fan of Lillie's Q's grits, and after speaking with Chef Kody, we now know why. Make sure to dig into a bowl or two of these during brunch because they are flown in from South Carolina from Carolina Plantation and are stone-ground. After that, we're betting the restaurant's kitchen uses magic to make them so smooth and creamy. Their collard greens are served with hot pepper vinegar to pour over just in case, and the green beans are blanched to maintain crispiness and served with bacon and apple cider vinaigrette. As for the potatoes, these are smashed red potatoes that come with caramelized onions and chili powder. The second tray we got was full of more goodies including their tilapia (two ways: fried with cornmeal crust and blackened with Louisiana BBQ shrimp sauce); roasted corn (marinated in mayonnaise, brown sugar, and lime before being roasted); housemade biscuits and gravy; Brunswick stew; 2-hour smoked hot links; 14-hour smoked brisket; and 4-hour smoked turkey. Having two choices of tilapia is a great idea for the indecisive though the meat station will likely cause decision-making issues. Lucky for us, they served up a little of every type at the live station. We enjoyed the hot links very much for their smoky intensity but found the turkey, though moist, to be one note throughout. As for the brisket, it is always good here and after 14 hours of being smoked and handled over peach wood, it did not disappoint. Of course, what is a buffet without dessert? You can hop to it immediately by playing with their chocolate fountain complete with beignets, strawberries, and marshmallows for dipping, or you can built your own biscuit shortcakes with strawberry compote. Brunch also features small bite-sized desserts such as their seasonal cobbler (peach that day), Grandma Lillie's banana pudding, and stout brownies (that day made with non-stout Old Chub and macerated strawberries within). Each of these can easily satisfy whatever style of dessert fits your fancy be it savory from the biscuit shortcakes to sweet in their banana pudding to decadent via chocolate fountain. All in all, the brunch had an excellent spread of food and for just $24.99 (kids are $9.99), that's a steal! If interested, find Lillie's Q at 240 S Brea Blvd in Brea for a healthy helping of delicious Southern hospitality. Holiday incentive: Purchase $50 in gift cards (any denomination) and receive one complimentary Sunday Brunch (redeemable January 1st through November 30th in 2016). Offer valid 11/1/15-12/31/15.